Just 24 hours after Rick Perry's memory block in the Michigan GOP Presidential Debate, Rick Perry appeared on David Letterman's "Top 10". It's great to see Rick Perry show a sense of humor! 10. "Actually, there were three reasons I messed up last night. One was the nerves, and two was the headache, and three ... oops." 9. "I don't know what you¹re talking about - I think things went well." 8. "Hey, I was up late last night watching Dancing with the Stars." 6. "Hey listen. You try concentrating with Mitt Romney smiling at you. That is one handsome dude." 4. "I had a five hour energy drink, six hours before the debate." 3. "You know, I really hoped it would get me on my favorite talk show, but instead I ended up here." 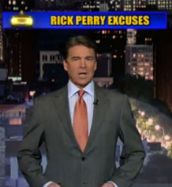 Related Content: Will Rick Perry's Memory Gaffe in Debate take him from Collapse to Presidential Contender?